Originally posted: April 6, 2019 . Last modified: April 7, 2019 . 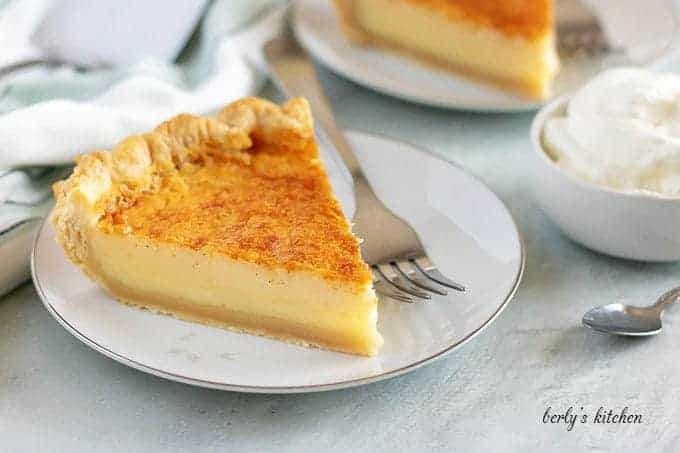 A quick and easy buttermilk pie. It’s an old fashioned recipe, made from scratch, using simple ingredients. The hardest part is waiting for it to cool! Buttermilk pie, one of my favorite desserts. I can’t remember exactly when I first tried it, but I know it was an early childhood favorite. Most of the time, I got it at diners or restaurants. It wasn’t until after Kim and I got married that we started making it home. 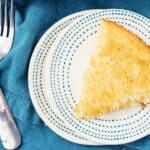 A few days ago she informed me that she was going to share the buttermilk custard pie to our blog. Needless to say, I’m happy that she decided to post the recipe. It’s sweet, tart, and full of flavor. Now, enough exposition, let’s get into the kitchen! To get started, preheat your oven to 350 degrees F. and either grab your pie crust or make one. For this recipe Kim decided to make a homemade crust. She used the pie crust recipe from her Granny Smith Apple Pie blog post. Store bought ones work just fine, so if you’re pressed for time, just buy one. The important thing is that the crust is NOT pre-baked. Otherwise, it will burn. After that, grab a large mixing bowl and a whisk or hand blender. 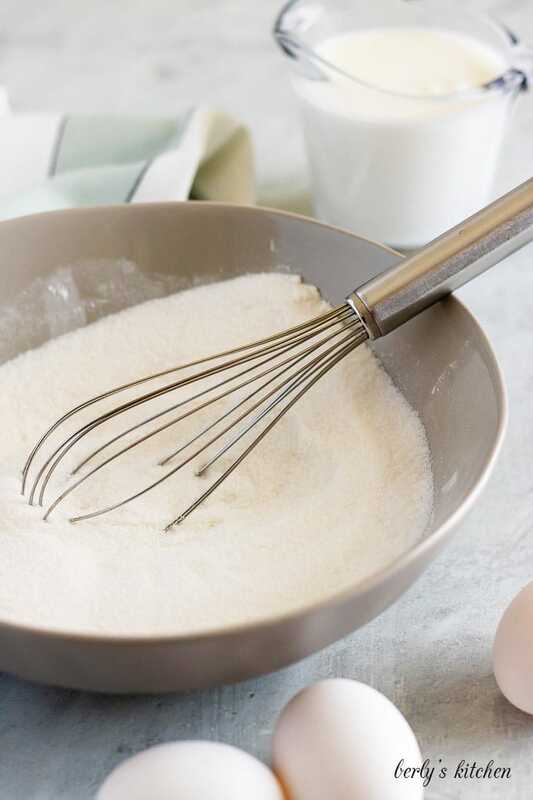 Combine the sugar, flour, and whisk in the eggs. Then pour in the buttermilk, melted butter, lemon juice, vanilla, and nutmeg. Give everything a good mixing to ensure all the ingredients are properly blended. At this point, all you need to do is gently ladle or pour the batter into the crust and bake your buttermilk pie. Place it in the oven for forty (40) to forty-five minutes (45), or until the top is lightly browned. 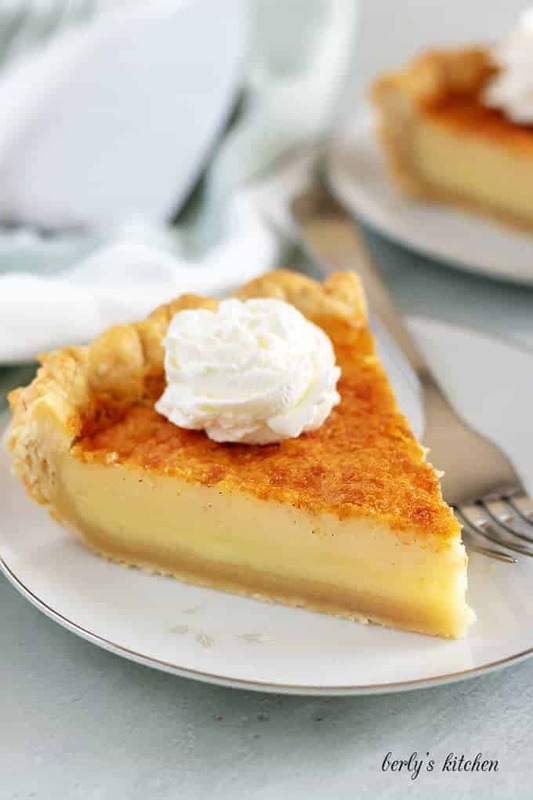 Once the buttermilk pie is done cooking, remove it from the oven and let it sit on a cooling rack for an hour before placing into your fridge to cool for an additional two (2) hours. That’s it, you’re is pie done and after it cools you can serve it as-is or top it with whipped cream. Kim and I hope you enjoyed the recipe! Nutmeg can be very tricky. For me, I like it, so the one-fourth (1/4) of a teaspoon in the recipe is fine. You, on the other, may not like that much nutmeg. I recommend leaving it out altogether or reducing it to one-eighth (1/8) of a teaspoon. We’ve found that our pie crusts bake better in glass pie dishes. There’s nothing wrong with aluminum or metal, it just seems to me that the crusts come out better when using a glass dish. If you don’t have the time or you forget to let the melted butter cool, then pour it in at the same time as the buttermilk. This step will prevent the eggs from scrambling due to the warm butter. 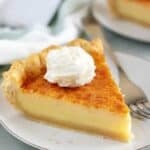 If you enjoyed our easy buttermilk pie recipe, please leave us a comment and rate the recipe card. You can also find us on Facebook, Pinterest, Twitter, and Instagram by searching for Berly’s Kitchen! In a large mixing bowl, combine granulated sugar and flour. Whisk in eggs. Add the buttermilk, melted butter, lemon juice, vanilla, and nutmeg. Pour the batter into the pie crust, and bake for 40-45 minutes or until the top is lightly browned. 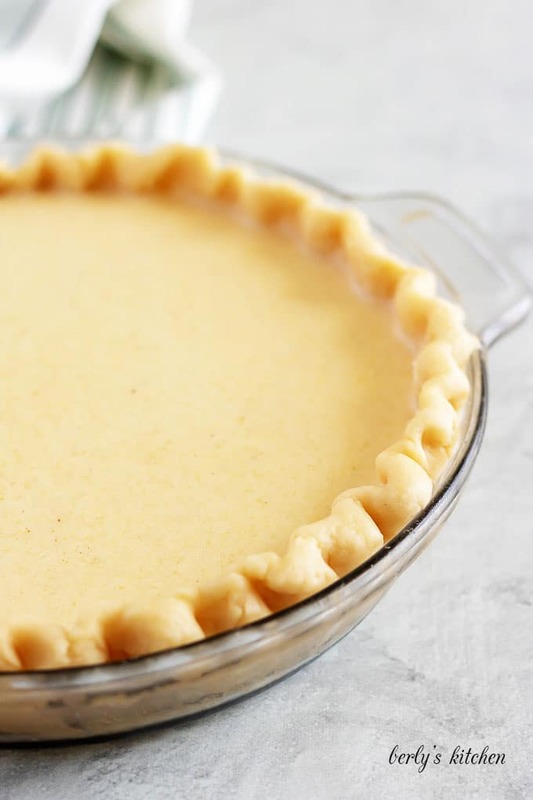 Remove the pie from the oven, and allow it to cool at room temperature for an hour before transferring to the refrigerator. Cool completely before serving. 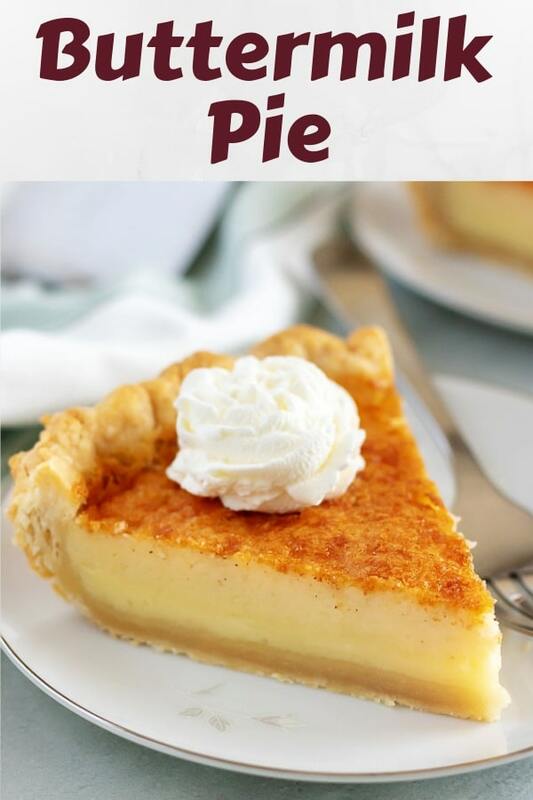 The calories listed are an approximation based on the ingredients and a serving size of one (1) slice of pie when it has been cut into eight (8) equal sized servings. The calorie count does NOT include the whipped topping seen in the photographs. Actual calories will vary. The buttermilk pie can be stored in your fridge for up to the three (3) days.